Red Bull Rising: Another Red Bull on the Net! Another Red Bull on the Net! Thanks to milblogging.com--as well as my fellow blogger Kentucky Woman--I recently found a mil-blog written by Capt. 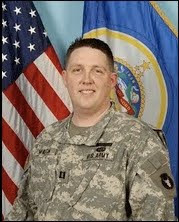 Mark Martin, Minnesota Army National Guard. Martin is apparently working as an Embedded Training Team (ETT) member in Northern Afghanistan, near the town of Mazar-i-Sharif. Click here to find his "270 Days in Afghanistan" blog. Apparently, he's teammates with a couple of Croatian soldiers, so he may be more rightly regarded as a member of an Operational Mentor and Liaison Team (OMLT). It always cracks me up to note that the European acronym is pronounced "omelette." I'm sure they're all a bunch of (cannot ... stop ... myself ...) "good eggs." Notably, Martin is the first fellow wearer of the Red Bull patch (see the cow on his left shoulder, above) that I've found on the Internet. I don't know how often he's able to write--or how good his Internet connection is--but I hope he keeps it coming. It's good, informative, and plain-spoken--all things I aspire to be, too. A quick note about how to "read" an Army uniform, by the way: The left-shoulder patch is your unit patch. The right-shoulder patch is your "combat" patch (technically, called "shoulder sleeve insignia" or "S.S.I."). While the newer Army Combat Uniform (ACU) offers fewer clues as to a soldier's past accomplishments and qualifications, it's common practice for soldiers to check out the new guy's (or gal's) right shoulder, to see if they've been "over there." While you can't see his right side, Martin apparently commanded a company in Iraq 2006-2007. 'Nuff said on that. That, however, is a story for another day. Maybe tomorrow? Thanks for the information on the shoulder patches. One of my adopted soldies sent me his after his return and I have a question about the flag one - why is it reversed? Of course, the U.S. has a tradition of NOT placing any emblem above the national colors, so the unit-above-flag configuration was changed with the Army Combat Uniform (ACU). The national flag is now on the RIGHT shoulder, ABOVE the combat patch (if the individual soldier is authorized one; if not, no other patch is worn). Because it's on the RIGHT shoulder, the blue starry "union" of the U.S. flag would appear to the rear of the soldier when viewed in profile. The story goes that someone way up the military food chain determined that this made the flag appear as if it were retreating, rather than advancing. So the patch-manufacturing industry started producing U.S. flags which feature the union on the right-hand side. I'll have to check the Sherpa family album when I get home, but I don't believe the Aussies wear a "reversed" version of their flag--they have a "usually only seen one way" design problem similar to that of the U.S. colors. Further information: The exchange of unit patches is it's own little tradition. It's typically done between people with high regard for each other: colleagues who have worked with each other, or people who have had a significant positive affect on the unit's mission. Put another way? It's probably kind of like the whole exchange of a token-emblem and champion's crest on the Renaissance Faire circuit. I hope my meanderings help not only explain the patch thing a little more, but possibly widen your appreciation of what your soldier was perhaps trying to say with his gift. Thanks for the question ... This was fun! Isn't it also true that the flag faces 'backwards' because that's the way the flag would fly when the US soldier is advancing, because US soldiers always lead from the front? Or something like that? @ Brat: Exactly! Imagine the flag attached to a pole, carried by a soldier. Interestingly (? ), the same logic is applied to flags that are painted on airplanes. (I'm sitting at the Atlanta airport as I write this. The blue "union" of the American flag is always located toward the front of the aircraft--the way it would "fly" when the plane is in motion. This makes more sense, given that: the beloved maple leaf seems symmetrical (there is no "backwards"; the grommets for attaching the flag to a pole would only be on one side. Coincidentally, the incident took place at an Atlanta Braves home game. All roads lead to Atlanta today!